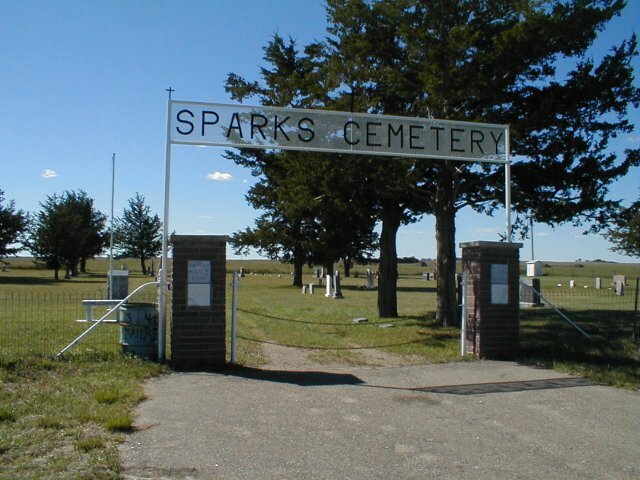 The Sparks Cemetery is an old cemetery, being there since the 1880's. The first person buried there was a small girl, Daughter of John S. Grooms. Her name was Stella Grooms. She died July 22,1885 at 1 1/2 yrs of age. The cemetery is on land previously owned by "Chaufty". Upon hearing of the death of Stella Grooms, Mrs. Chaufty deeded one acre of their land for the beginning of the Sparks Cemetery. In later years another 1/2 acre was donated by the Chaufty's to enlarge the cemetery. The west side is the oldest part of the cemetery. New brick and cement posts were added to the entrance to the cemetery in 1967 and a new fence along the front side was added at that time. Barker, Mary George(wife of Henry F. m.05-01-1865) 05-16-1845 03-08-1917 Fayette Co., Ill.
Brechbill, Jane James(wife of Abraham m.05-02-1864) 04-12-1846 03-22-1926 Galena, ILL.
Copeland, John Fredrick(hus of Betty Osburn m.04-12-1947)(son of Fred & Clara Ehtel Ogle Copeland) 02-07-1920 10-20-2002 ? ? ? Foster, Baby(child of Charlie) ? ? Grooms, John(hus of Sarah Headrich m.08-08-1842)(son of William & Mary Grooms) 05-10-1817 05-10-1903 Clark County, Ky.
Grooms, John Samuel(hus of Rebecca Ann Osburn m.09-07-1872)(son of John& Sarah) 02-02-1853 07-10-1927 Quitman, MO. Newland, Infant(of Isaac) ? ? Spivey, Emmett H.(hus of Mary Ellen Copeland) ? 02-01-2008 ? This cemetery was walked by Ruth Harms in 1974. Corrections were added 10-2004 by Hazel Brown. We apologize for any errors in reading or transcribing of information. For corrections please contact the Cherry County Coordinator.